Cryogenic Landforms: What Is A Pingo? A pingo is a mound of earth-covered ice that can reach up to 230 ft in height, and is found in the Arctic and subarctic regions of the world. Pingos near Tuktoyaktuk, Northwest Territories, Canada. Landforms are common natural features on the surface of the earth or other planetary bodies. Landforms influence the terrain and the topography of an area. Some of the typical landforms include hills, mountains, valleys, and plateaus and are categorized according to their physical attributes such as elevation and slopes. Landforms are also categorized according to the processes they were formed. One of the most outstanding landforms in the Arctic and Subarctic is the Pingo. A pingo is a hill of earth-covered ice that can reach up to 230 ft in height and is found in the Arctic and subarctic. 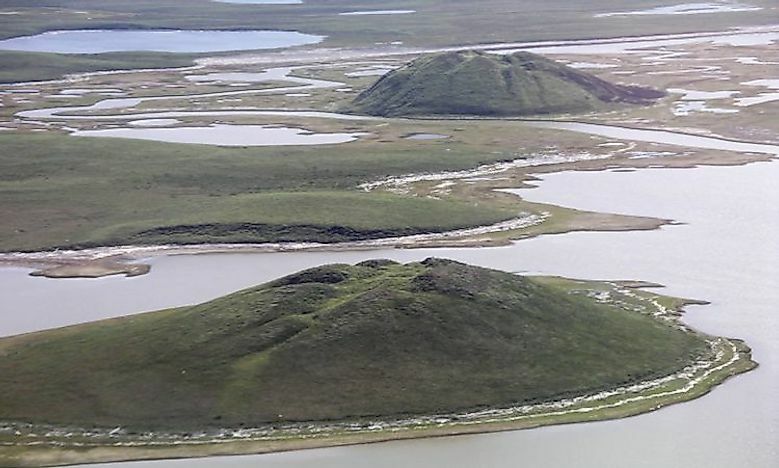 The term pingo originates from Inuvialuktun which translates to “small hill.” Pingos are periglacial landforms which are formed through processes linked to the cold climate. Pingos are grouped as either large or small. Smaller pingos have rounded tops while large pingos have breaks in the ice top. Large pingos may form craters with cones which look like those of volcanoes. Pingos that form on bedrocks also have the characteristics of large pingos. Pingos are broadly classified as hydrostatic or closed-system pingos and hydraulic or open-system. Both pingos can be distinguished from each other by determining if the lake deposits are associated with their formation. Pingos formed on the slopes are relatively small and irregular in shape and are formed due to the hydraulic pressure. Pingos formed on flat areas like old lake basins are much larger than those built on the slopes. More than 11,000 pingos are spread across the surface of the earth. One of the highest areas with the concentration of pingos is in the Tuktoyaktuk in the Mackenzie Delta. The area has over 1350 examples of pingos with eight of these landforms protected in the Pingo National Landmark. The world’s known highest pingo, Kadleroshilik pingo, is located in Alaska. Canada, Norway, Greenland, and Siberia are some of the countries famous for pingos. Ruins of pingos can also be found in Norfolk, England, and Netherlands. Cryogenic Landforms: What Are Palsas?